I really got lucky the Saturday before last when my local Target had the Who What Wear collection on display about a week earlier than it was supposed to be released. There was no signage, just the collection out on the racks. I kind of thought something must be wrong, but I took full advantage of it being out and scooped up this button up blouse in the best black and white dot print. Sure enough, about three days later (yes, I am at Target that often), it was all gone! Guess they realized they screwed up. Today I’m 31 weeks pregnant and will post an update later on this week on those details. Clothes are definitely fitting…. well, TIGHT, and so I’m taking full advantage of loose fabrics that are comfortable, but not sloppy. (That’s the goal, anyway.) I think this look would work so well for any other pregnant mamas out there, but I will totally be all about this look when he’s here and my body returns to normal, too. 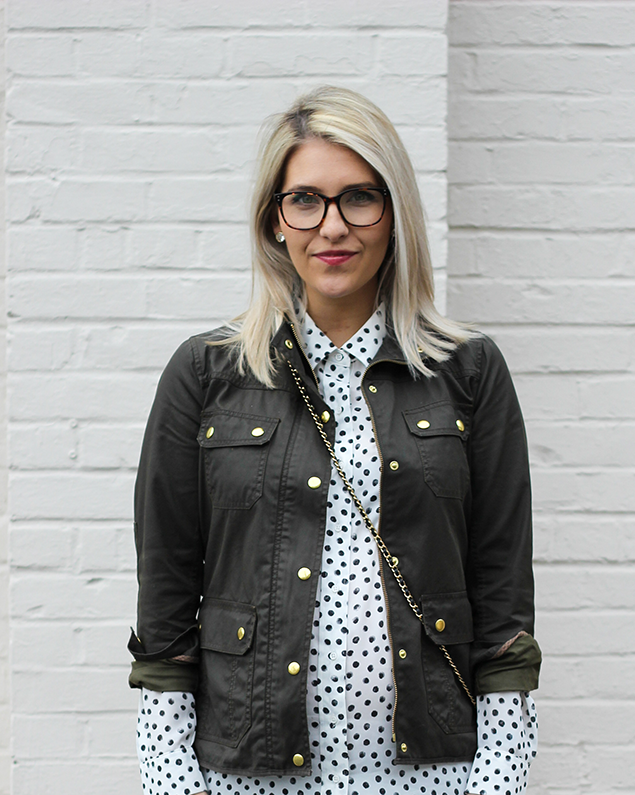 I got size Medium in the shirt and really—I think I probably would have preferred that size if I weren’t pregnant. 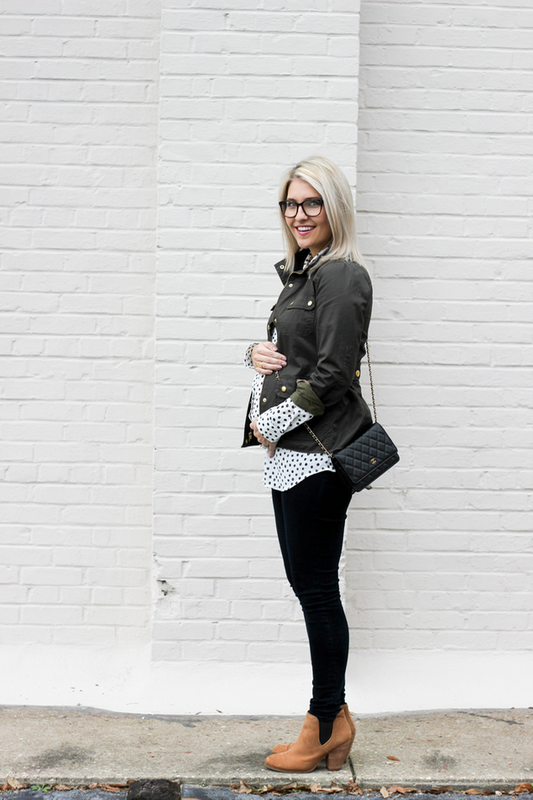 I like my button downs to fit big and to pair them with skinny jeans like I did in this look. The jeans are the same old J. Brand Maternity Jeans I’ve worn all along. I used to think they were black, but now after lots of washes, I can see they are actually navy. That’s kind of like two jeans in one, right? 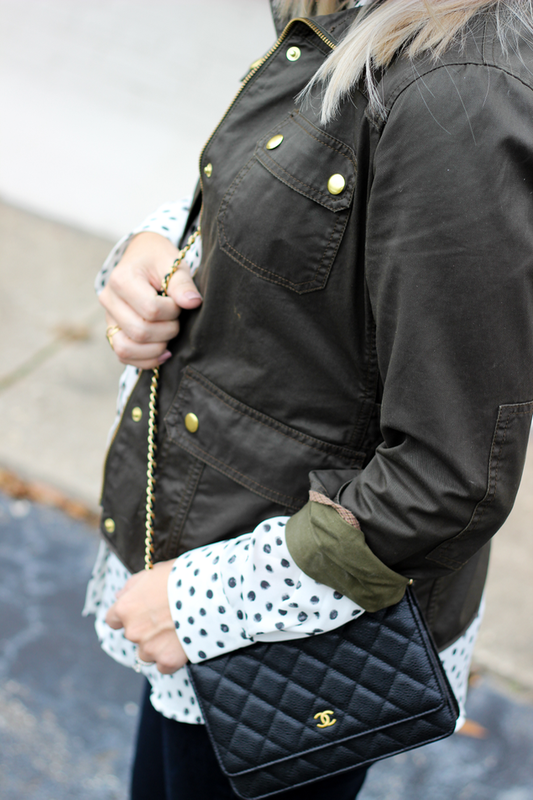 The field jacket is a favorite from J. Crew. 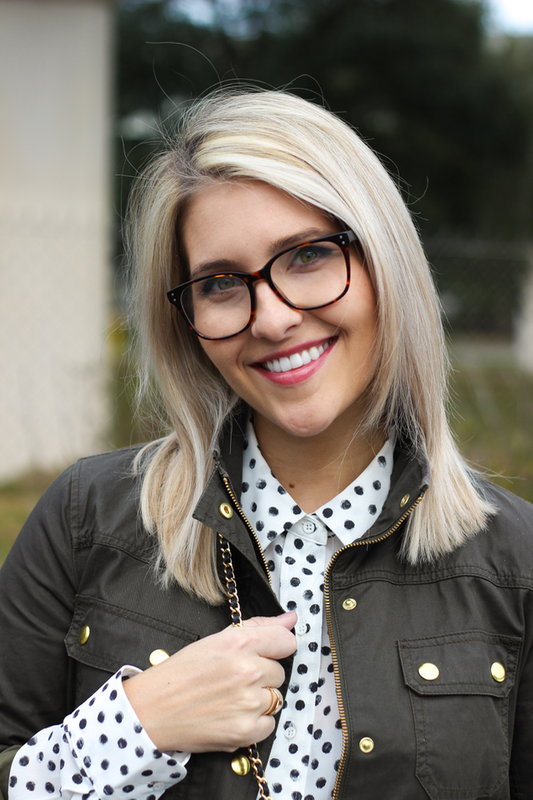 My glasses aren’t prescription, but for $26, they are a fun accessory to throw on. The item number on mine says F040, but these look nearly identical to mine. I picked up that Chanel Wallet on Chain bag over the summer and don’t think I’ve shared it on here at all. It was a splurge, but a bag is my favorite thing to treat myself with after saving up some bucks. This one is great because you can tuck in the chain and use it as a clutch or a wallet. You can double the chain and wear it as a shorter bag, or you can wear it like I have it shown here. It’s very versatile and the perfect size for running around town hands-free or for a night out. I mainly use it at night, but thought I’d dress up this outfit with it. Oh and the booties—y’all have seen those a million times because they are big favorites of mine. They are called the Vince Camuto Hame Leather Ankle Boots. These are similar. p.s. another home update coming tomorrow! p.p.s. Beautycounter has a great deal today! If you buy any eye shadow duo, you will get a free precision brush ($23 value!). Also, spend over $200 and get a free Rose Neroli Body Oil, which is amazing. It’s great to mix in with your body moisturizer for extra hydration, plus it smells great and is sooo soothing. I love that purse and that blouse! So cute!! Will definitely bookmark this in case I have another April baby — I got stuck in a rut of wearing black leggings and long sleeve t-shirts all the time last winter. 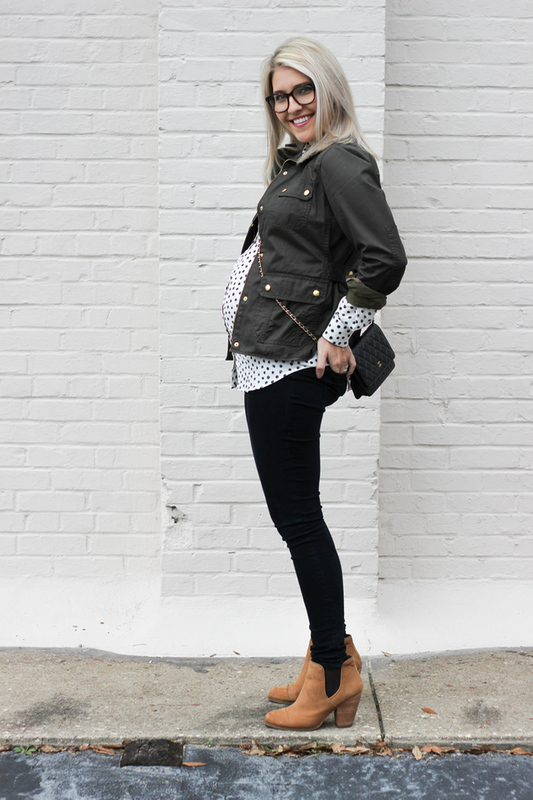 I think I should've gotten a legitimate pair of nice maternity jeans and just worn them the whole time through. 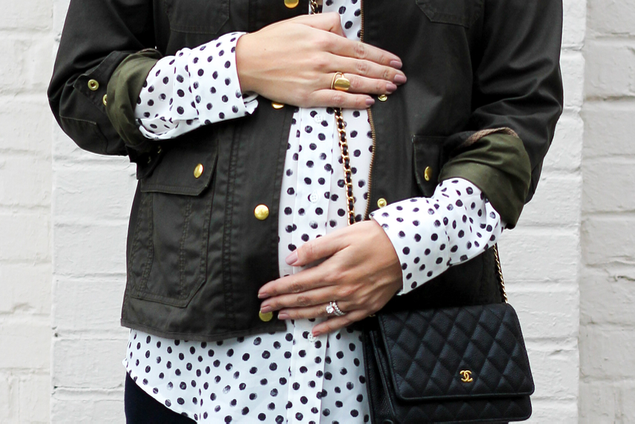 Would you recommend getting the size that fits at the beginning of 2nd trimester or sizing up just in case? It's so hard trying to dress for a changing body when you don't know what to expect exactly, and you don't want to spend too much since it's only for a limited time. (I'm getting ahead of myself here now anyways — who knows when another baby will happen?!) Hope y'all had pretty weather over the weekend in Charleston! Love your outfit! I saw the new collection at Target yesterday and I love the shirt you picked and the matching midi skirt! I want the Chanel!! So perfect for running around!